Oliphant Earns 2nd MA Degree From Georgetown U. By Edgefield Advertiser on June 22, 2014 Comments Off on Oliphant Earns 2nd MA Degree From Georgetown U. Miss Kathy S. Oliphant graduated on April 26, 2014, from Georgetown University earning an Executive Master’s degree in Business Administration (MBA). 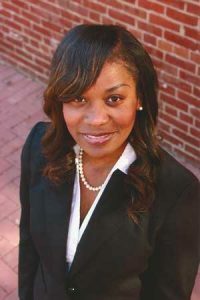 She holds a BA degree in history education and an Master of Education in counselor education, from S.C. State University. Ms. Oliphant was awarded a US Army Green to Gold Scholarship to pursue her MA degree and was commissioned as a second lieutenant. She is an Army veteran who proudly served her country for nearly 10 years. She currently works for Naval Sea Systems Command as a Government Furnished Systems Manager where she manages all integrated logistics support for complex technology systems installed on the Gerald R. Ford Aircraft Carrier. She is a leader in the 21st century and is pursuing a position in the Senior Executive Service career field. She is a 1991 graduate of Strom Thurmond High School and is the daughter of Robert and Kathy Hall Oliphant of Johnston, S.C.